If your dreams involve stomping around Terra Firma in a BMW X5 xDrive while running on good 'ole American diesel, consider yourself a step closer. BMW unveiled their X5 xDrive35d today, with it's sequentially turbocharged six-pot diesel, at the LA Auto Show. Precisely the same powerplant is slotted for the 335d Sedan. Fuel mileage estimates sit at an acceptable 19mpg city and 26mpg highway while making 0-60 jaunts a 6.9 second affair. Power output is rated at 265 horsepower with 425 reality-bending pound-feet of torque. Full press release below the jump. BMW Advanced Diesel with BluePerformance: efficiency and dynamics in abundance With the introduction of the new BMW Advanced diesel powered 335d and X5 xDrive35d models, the BMW Group announces another step in its strategy for EfficientDynamics. Both models will feature a 50-state emission compliant version of BMW's award winning sequential-turbo 3.0-liter diesel engine - the first performance-oriented and efficient Advanced Diesel engine in BMW's U.S. line. The sequential-turbo 3.0-liter diesel engine powering both models employs both a very small and a larger turbocharger combined with an innovative intake system enabling the engine to develop 265 hp. Even more impressive are the torque characteristics. Fully 80% of the torque is available from 1100rpm to 4200rpm. The peak torque is 425 lbs-ft at 1750rpm - almost as much as BMW's 6.0-liter V12. The performance is what the enthusiast would expect from a BMW. The 335d is capable of sprinting from 0 - 60 mph in six seconds flat. 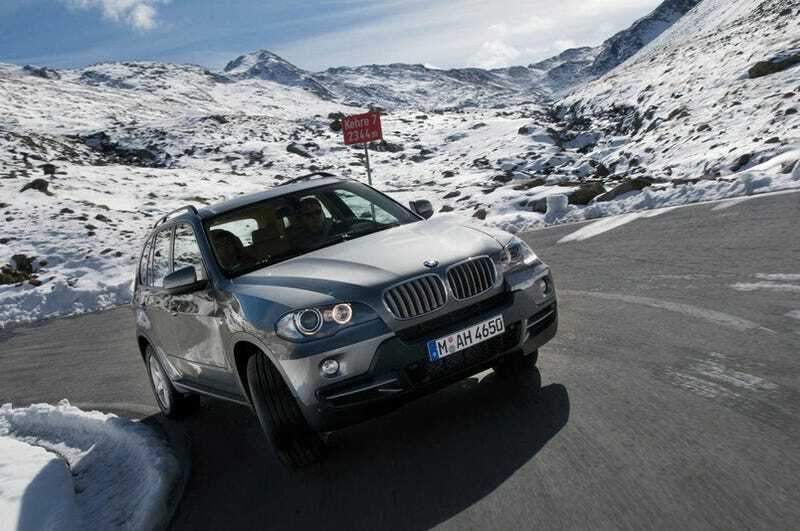 The X5 xDrive35d will do it in 6.9 seconds. No other diesels in the US will perform like this pair of BMW Advanced Diesel models. Coupled with this performance potential is impressive fuel economy. The EPA mileage estimates for the 335d are 23 city and 36 highway. The X5 xDrive35d is rated at 19 mpg city and 26 mpg highway. Both offer the convenience of travelling approximately 580 miles between fill-ups. Thanks to BluePerformance technology, this unparalleled blend of performance and efficiency can only be found in a BMW Advanced Diesel.